A vocal minority of consumers are advocates of sustainable living, but few are willing to pay up for it. Surveys show that few consumers are prepared to pay more for green products, let alone ones that embrace fully circular principles. And what they tell pollsters may overstate their real appetite to do so. 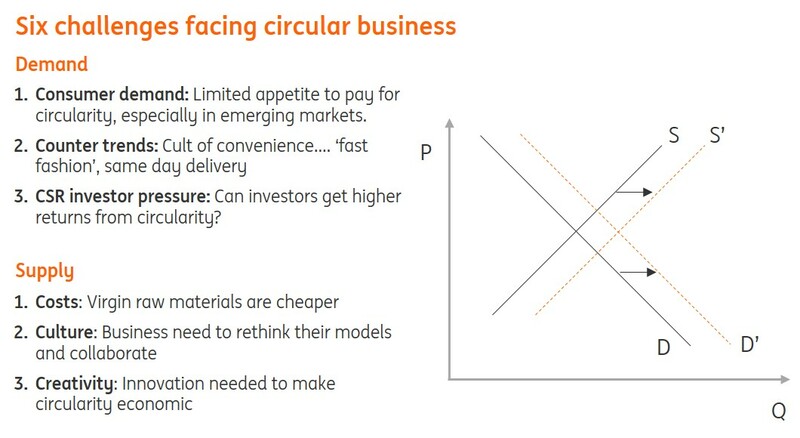 Lack of accepted definitions and labelling of circular products doesn’t help, but in any case, businesses face the challenge of making them price competitive. Although sustainability is now a cultural trend, there are still cultural trends running in the opposite direction. Some business models are not merely waste-intensively linear, but actively accelerating resource use. Fast fashion has spurred rapid increases in clothing purchases and disposal, with so far limited push back. E-commerce is fuelling a want-it-now culture of over-ordering, fast delivery and return. Moreover, the burgeoning middle class in the emerging markets are embracing the consumerist habits of the developed world. Businesses are also facing pressure to ‘go circular’ from investors adopting more ethical corporate and social responsibility (CSR) principles. But while this trend is growing, it is hampered by controversies over whether these principles lead to higher investment returns. Some studies show that they do, but the question of whether the profitability of sustainable principles is the cause or the effect of business success is unresolved. For many businesses it is cheaper to use virgin raw materials or brand new parts rather than to embrace recycling, reuse or reassembly. Prices of non-renewable resources, while volatile, have been cycling around a flat trend for decades, providing little incentive to limit their consumption. Apart from cost, it is simply easier for businesses to continue with traditional resource-using production and distribution methods. Although enlightened large corporations and idealistic start-ups are embracing circular principles, there is still a long way to go in shifting corporate cultures towards circular economy principles. In part this is because, unlike the traditional linear business model, the circular business model involves new forms of collaboration and transaction with companies along, and even outside, existing supply chains. Having accepted the culture of circularity, companies need to innovate and invest in it. Creativity is required not just around eco-design, reuse, repair, and recycling, but also business processes, supply chains and market places for recycling and second-hand products, parts and materials. Of these challenges, the final challenge of creativity is perhaps the most important. Innovative breakthroughs would go a long way in helping to address the other challenges. The precedent of the rapid progress in reducing the cost of renewable energy, and the development of new platform businesses, give hope that business can accelerate progress towards the pervasive adoption of the circular economy in the long term. But in the meantime, policy intervention is needed to incentivise action through taxes and subsidies, positive advocacy and proscriptive rules and regulations.